"I plan on buying a possible engagement ring in a pawn shop but I don't know what to look for. How can I tell if its a good diamond and can I fix it up to look like its brand new so my girlfriend won't know i bought it in a pawn shop. thanks, greg"
"1. You will get a better deal (better diamond at a better price) if you buy from a jeweler, not a pawn shop. 2. 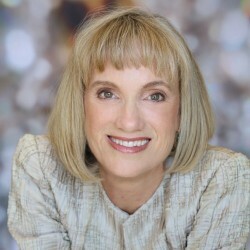 Although this website is not for relationship advice, I'll go out on a limb and suggest that being anything less than completely straightforward and honest with your girlfriend may not be the best way to start a lifelong trust-based relationship. Ben"
Is Your Fiance OK With a Pawn Shop Diamond? First and foremost make sure that your fiance is OK with your choice of vendor. If she is OK with that, I'd recommend that you take her with you as that will ensure that she really is cool with it. In this post I'll give you how-to's for diamond shopping at a Pawn Shops. and I'll also tell you the benefits of buying your engagement diamond from a good jeweler. Can Engaged or Soon to be Engaged Couples Save Money Buying Antique Engagement Rings at a Pawn Shop? I've heard both the good and the bad about pawn shop diamond shopping. Some have saved money, but just about as many people have gone on to regret their decision. If you are really looking for a true “vintage” or “antique” diamond, you are better off to work with a jeweler who deals in estate or antique jewelry, or one who has access to estate or antique pieces. 1. Establish ahead of time the size range, diamond shape, color range and clarity range you want. This is important not only because it will help you quickly narrow down the options that are available to you, but also so that it is easier for you to compare notes on rings that fit your criteria if you are shopping at several different pawn shop locations. Go online and get ideas for prices for 1ct. or the size you are looking for. That way you can have a sense if a diamond you are considering is a better than average price. 3. Get a loupe and learn how to use it properly. You will want to come prepared, so I recommend buying your own loupe if you are going to pawn shops. It also provides the added benefit of making you look more experienced, which may deter the broker from trying to take advantage of you. Here’s my blog post on how to use a loupe. When looking at diamonds check for inclusions in the diamond. You’re not looking for a diamond that is perfectly clear. I mean you’re looking for a deal right? It's OK if there are some inclusions as long as they are not visible to the naked eye. More inclusions often mean less sparkle. For a ring you’ll be wearing daily, clarity and sparkle are quite important. If there are too many inclusions then walk away. 4. Bring a friend who has some knowledge about diamonds if you can find one. The longer the ring(s) you are looking at have been sitting in the showcase, the better the chance there is that its price tag doesn't reflect the recent quadrupling of gold prices. Diamond prices have been going up as well, so older price tags are good news for you. Look at the condition of the price tag to tell you how long the ring has been in the showcase. The longer it's been in the inventory, the deeper the discount you are likely to receive to move it along. Faded looking ink on the tag is a good indicator that the ring has been there for a few years. 6. Bring someone with you who wears a larger diamond with a known color and clarity for comparison purposes. Have the ring thoroughly cleaned before your shopping trip. A dirty D color diamond might look like an H color which is not good. You comparing a dirty diamond to one in a pawn shop could make you think you're looking at a D color. When you are not. Ouch. If you don’t have any experienced friends then you can just bring someone with you who is wearing a large, good size diamond with nice color; It will be great for side by side comparisons of diamond color. Just look at both diamonds under the same lighting. See above about cleaning it first. 7. When you decide to purchase, make sure to get it in writing that the diamond is natural and untreated. With the recent uptick in diamond simulants, and treatments like fracture filled diamonds, laser drilled diamonds and clear but imitation gems, it’s important to get the seller to provide you with a written statement that says the gemstones are genuine, untreated, natural diamonds. Your stone could be a clarity enhanced diamond. Clarity enhanced diamonds are treated with a high heat, high pressure treatment that improves clarity. Check out an interesting video showing a before and after of a clarity enhanced diamond and also showing a fracture filled diamond. Your stone could be a Moissanites. Moissanite looks like diamond and is almost as hard as a diamond, but it is not a diamond. It's grown in a lab. Check out my blog post: "What About Moissanite for Your Engagement Ring?" Your stone could be a CZ. Cubic Zerconia or CZ as it is commonly referred to. This stone is made in a lab at a cost of a few dollars. It certainly won't hold up like a diamond or a Moissanite stone. For more information on CZ's, you can check out my blog post: "CZ vs Diamond for Your Engagement Ring." By taking precautions to get a written guarantee on the type of stone you are purchasing, you are able to protect yourself and your purchase. In the future, if you have the diamond appraised by a certified appraiser and it turns out not to be what is written in the guarantee, you will have recourse against the seller. 8. Be prepared with your own appraiser to swiftly get your diamond choice checked out. When you go to have the diamond checked by an appraiser, don't use the one the pawn shop broker recommends. This article is about an unethical practice between appraisers and sellers in New York. If they can do it there, they can do it anywhere. I recommend that you find your own respected certified appraiser picked out ahead of time. You don’t need tell anyone what appraiser you will be seeing. But do tell them that you will be seeing an appraiser. If there is anything they are uncomfortable with about the diamond, like a treatment they haven’t disclosed, they should mention it at this point. 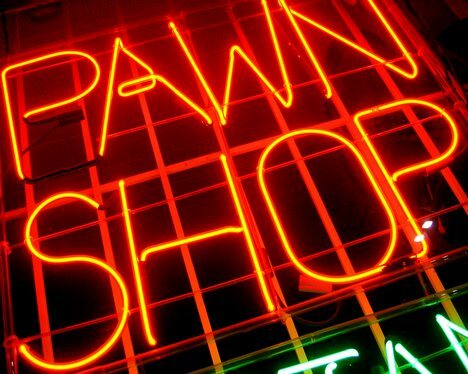 Since you are keeping your business to yourself, which is wise, I would recommend against mentioning the pawn shop's name to your appraiser. Just say a private party wishes to sell the diamond ring. I’d bring the ring in without the price tag attached, because the price tag might tell the appraiser who the pawn broker is and if they have a relationship then it will be better for the pawn broker than for you. 9. Don’t ignore the ugly duckling rings that might have a great diamond. Most couples, when going to pawn shops, are looking for a ring that is either very simple or has beautiful old filigree details. I encourage couples to look at the ugly duckling rings too for their diamonds. I have seen some ghastly awful old rings with nice diamonds in them. One young woman showed me an old ring from her mother with a square-ish box-like setting that covered a lot of the diamond edges. 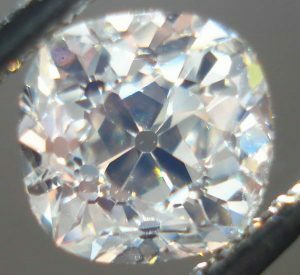 When we removed and cleaned the diamond, it turned out to be beautiful. We were able to custom design a light airy ring to show it off. The whole family was surprised at how pretty her ring was since the older ring had sat unloved in a safety deposit box for years. If you find an ugly duckling ring with a nice diamond, get rid of the setting and use the diamond in a design that is your taste. 1. Your jeweler will help you figure out a good size, color and clarity while keeping your budget in mind. Lean on their expertise. Your jeweler can take time to explain the 4C’s of diamond buying to you, and can advise you, based on your budget and your idea of the perfect stone for you, where there might be some give and take between several stones to help you find your perfect diamond match. 2. Your jeweler will tell you about diamond prices. Calla Explaining to Lisa the Things to Look for in a Diamond. 3. 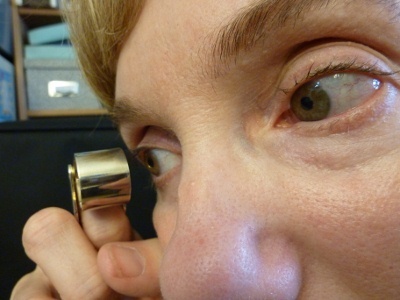 Your jeweler will have a loupe and show you how to use it and what to look for. 4. Your jeweler can be that knowledgeable friend answering all your questions. See my blog post; How to Choose a Jeweler. 5. You can ask your jeweler for a "Deal," he may have something special to show you. Older cut diamonds can often give you that lower price you are looking for. Also ask about prices for other diamond shapes. There may be a deal on a marquis shape diamond that your jeweler has too many of. See my blog about older cuts of diamonds. 6. Your jeweler will have diamonds to compare with whichever ones you are looking at. 7. Your jeweler will be knowledgeable about all potential diamond treatments and be able to discuss them with you. 8. Your jeweler may already have excellent certification for your chosen diamond by, for example, GIA (Gemological Institute of America.). 9. Your jeweler may have an ugly duckling ring with a great looking diamond. Notice how much easier it was to read the jeweler list as opposed to the pawn shop list? You can expect the same level of ease with your jeweler as opposed to pawn shopping for diamonds. Like the guy at the top who answered that online question, going with a local jeweler in purchasing your diamond can be satisfying in many ways. A good jeweler has probably been in town for a long time and has a good reputation that they are proud of. They want to educate you and help you in choosing the diamond to symbolize your love. Your jeweler knows how important this purchase is for you and all that it means to you. It's really nice to have a relationship with your jeweler. That's the jeweler you can go back to over the years for your other jewelry needs. It's a happy memory to have, how you went through the process of diamond selection and picking a ring for your love. Having a good jeweler, opens the door up for you to give your fiance the diamond in a simple solitaire setting and then going back together so she can be part of the design process with your jeweler. Your fiance will end up with a ring she absolutely loves the design of and a great story to tell her friends who will ask all about it. I encourage people who have gotten their ring at pawn shops to consider re-setting the diamond into a new design. People will ask you, “where did you get your ring?” whether it’s pretty or not, because it’s what we do. 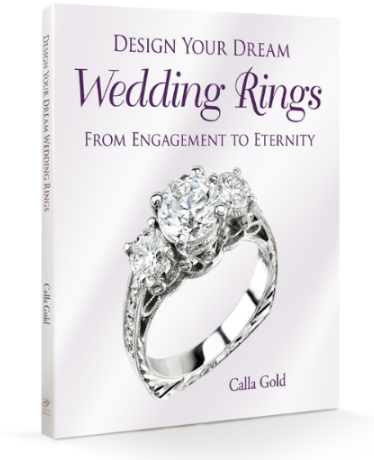 If you and your fiancé have chosen a new ring to put it in, your story is, “we picked it out together at The Wedding Emporium and really liked the curvy design.” Or; “We had my ring custom designed by Calla Gold Jewelry” or whatever. You shouldn't make the pawn shop part of your story. That’s just your shopping secret! If you purchased your ring at a pawn shop, by putting your previously owned diamond into a new design, you’ve made it your own. It’s now part of your happy story, not someone else’s history that you know nothing about. Together you’ll find your diamond. Together you’ll dream up the design. And together you’ll make a life, symbolized by your ring. Make it a happy story. This information about buying a diamond at a pawn shop or a jeweler is super helpful. I was slightly surprised you did it since you are such a good jeweler and obviously want your clients to buy their diamonds from you. But in typical Calla Gold jewelry blogger fashion you gave good and helpful advice. I thank you for that. It’s pretty classy of you Calla Gold. You’re the best. Calla, this was an amazing post! I think you were very wise to write it. After I read it, I thought there’s no way I would ever feel safe buying a diamond from a pawn shop. There are way too many things that can go wrong when you select such an important, expensive item from someone who doesn’t have the experience and expertise to guide you in a wise selection. Thank you as always for such a careful and thorough informative article! I would love to go to all of the pawnshops in the area and see what they have. If I found enough rings and other things I would probably start my own little pawn shop. How low has the price for something like a ring been? Thank you so much Calla for such an informative article.You have very well described about benefits and difference of buying the diamond from the pawn shop and jewelry.I also liked the idea of rework that one has to do after buying the ring from pawn shop in order to make it special. Calla, thank you for this info. I am considering purchasing a ring at a pawn shop. Here is the info I have – platinum setting with 1.17 carats of diamonds, two of these are approximately 1/5 ct each, center diamond is 1.59 ct VS2 clarity and H color. Is this sufficient info for you to give me a price range? Thank you for any advice.